Glad to finally change my picture ! Section 8 is done. I have a friend,Beth, machine embroidering "Myers General Store" for me to put in the sign area. Pinelands Barb & I cut a little bit today on the next section. We're excited to do the church with it's windows. We're already talking abt what we are going to do next since we only have 4 sections to go . 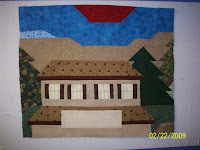 It will be another scenic quilt for sure. Any suggestions? The key word in this post is "DONE" -- anything about this quilt that's done is good news after all the pattern glitches. I'm eager to see what Beth does for your sign! Yes, we just have to do another pieced scenic, and we do need suggestions; but I'm hoping for an easier pattern to follow! This is turning out so cute! Great personal touches, too! I can't wait to see the finished quilt. This is really pretty..the sign will be a nice touch.